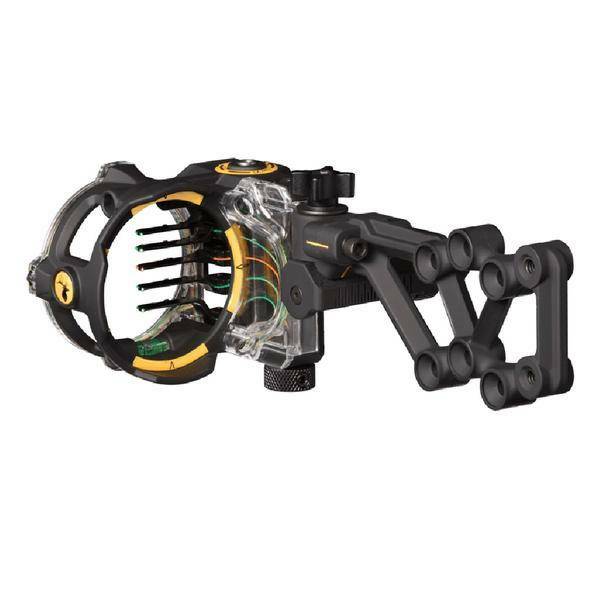 Working with a five-pin configuration, it provides you with all the adjustments needed for precision shooting. You can use it in the dark, as the rheostat light will ensure that you can adapt to the environment condition at any hour. Using the dual-axis adjustment system, it allows you to shoot at large distances and land successful shots. As an advanced or even a beginner user, you might not be particularly happy with the quality of the rheostat light; while it is true that it is supplied as an extra, the fact that it has subpar quality is a bit disappointing for a product that is, otherwise, superior in every way. – Even the most pretentious bowhunters can say that this is a bow sight that is worth the expense, down to the last penny. The excellent and durable construction is one of the main selling points of this model, simply because it can take a lot of wear and tear, which is not something you can usually say about such pieces of equipment. When you put your gear through extensive usage, you will notice that the pins will stay in place, and the overall construction will not suffer a dent. Besides the quality of the materials used, the way the bow sight is built guarantees that you will not have to search for a replacement anytime soon. – The number one reason why this model is praised for its precision is the fact that adjusting the pins is comfortable and easy. Moving the pins where you need them to be to ensure that they will provide the accuracy in the field you are expecting from such a piece of gear, is conducted without a glitch and you will enjoy mathematical precision that you wouldn’t normally get with other models, even more expensive than this one. – Let’s talk a little about the React technology that is employed by the manufacturer on this model. It is that thing that gives you the extra edge you need to make sure that your performance in the field is unrivaled. You only need to set two pins, and you will notice how the others will fall into the right place right away, which means that you don’t have to run complex mathematical operations just to set up your bow sight properly. – If you want to hunt in less than ideal light conditions, you will be convinced quite quickly that the Trophy Ridge React H5 is the right model for your needs. First things first, the pins are made from ultra-bright fiber optics that will glow in the dark, which means that you will gain an extra edge over your prey in this manner. Also, you must know that you will get a rheostat light, free of charge with your purchase. Seeing that this model is quite decently priced, you will appreciate not having to spend extra on accessories, like this one. You can adjust the brightness on the rheostat light as you see fit, so you will always be in charge of how your bow sight works. If you are on the lookout for an excellent bow sight, you should look no further than this model from Trophy Ridge. Available at a decent price, and also in two versions, for left-handed and right-handed users, it is almost everything you might want in such a piece of bowhunting gear. It is a multiple-pin model, equipped with five 0.19-inch pins displayed in the horizontal position to help you increase your accuracy tremendously when you are out in the field. Operating adjustments is easy, and you will appreciate the fact that you don’t need an extra tool to work on customizing the windage and the elevation. The same thing can be said about the dual-axis adjustment in place that makes sure that you are capable of shooting your arrows at long distances without a glitch. 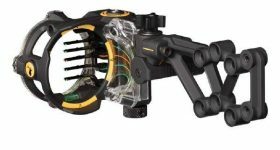 The mathematical precision this model is known for is based on the React technology offered by the manufacturer, to eliminate all the guesswork from operating a bow sight. For the price, it is a great thing that the model comes with a rheostat light, even though some customers mention that this accessory is not on par with the rest of the equipment.